Mladá Boleslav, 26 September 2018 – Together, ŠKODA AUTO, the city of Prague and the Faculty of Transportation Sciences at the Czech Technical University in Prague will implement initiatives for sustainable urban mobility. Electromobility and digital mobility services are playing a role, as are new sharing models and the exchange of data between vehicles and infrastructure. The partners signed a memorandum of understanding in the Czech capital of Prague yesterday. CEO of the municipal company Operátor ICT, Michal Fišer, said, “We are delighted to be collaborating with ŠKODA AUTO on global projects in the automotive industry in Prague. We are ready to maximise the collaboration between us.” Operátor ICT is responsible for the development of intelligent solutions and technologies in the capital. The three partners are implementing concrete projects right from the start of the cooperation. The focus is on car-sharing models using future electric ŠKODA cars and the creation of a pool of electric scooters, for example. Other projects concern the area of ‘Smart Parking’. Drivers should be able to quickly and reliably find their way to an available parking space, thus avoiding unnecessary traffic. In addition, ŠKODA’s current and future mobility services are being connected to a travel card for public transport in Prague. Thus, the card will also provide its users with a car-sharing account in future. The city of Prague, together with its municipal company Operátor ICT, recently introduced the Moje Praha (My Prague) app, which also includes vehicles from ŠKODA AUTO DigiLab’s car-sharing platform HoppyGo. The app displays the so-called car-sharing atlas, which is continuously being expanded, and shows locations where you can currently find available cars from car-sharing providers. ŠKODA AUTO DigiLab was also involved in negotiations with the Czech Technical University, which is considered to be the country’s pre-eminent technical university. In future, the think tank will be assisting many of the projects or be responsible for leading them. 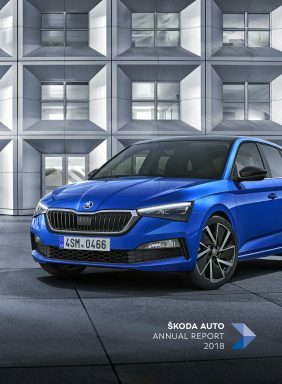 ŠKODA AUTO will be lending its support as an advisory partner to the Czech Republic and the capital city, Prague, with regards to all mobility projects. Together, the three parties will bid for grants from the European Institute of Innovation and Technology (EIT) which are available to support changes to mobility in cities. The memorandum’s topics of digitalisation, the advancement of technology and the expansion of electromobility are among the pillars of the 2025 Strategy – the car manufacturer’s plan for the future. With the development of sustainable urban mobility concepts, the company is consistently continuing the transformation from being purely a car manufacturer into a provider of holistic mobility solutions.